The former director of the Alabama Law Enforcement Agency said former Governor Robert Bentley wanted to know why his wife, Dianne shouldn't be arrested after he discovered she had been secretly recording his conversations with the aide suspected of being his mistress. Spencer Collier told FOX10 News anchor Bob Grip that Bentley wanted "whoever" recorded him arrested. Bentley initially believed Mrs. Bentley's Chief of Staff, Heather Hannah had been responsible. Collier said Bentley, "had his legal staff pull the statute [because] planting an eavesdropping device is a crime and disseminating information from an eavesdropping device is also a crime." ALEA got involved out of fear that, considering the Governor's "Top Secret" security clearance, he might be the target of blackmail. Collier said, "Once I become confident that Ms. Dianne was responsible for recording him, I told him and ended the investigation. He wanted to know why she couldn't be arrested for planting an eavesdropping device. I explained that in my opinion, no [District Attorney] in AL or the [Attorney General] was willing to prosecute a wife for recording her spouse caught in the act of adultery. I additionally explained that we felt no crime was committed and our investigation was concluded. He became upset and stated that if she or anyone disseminated the information that he would demand that they be arrested." Collier said Bentley's "daughter in law sent him a text at the end of Dec '15 or early Jan '16. The text was written in response to a "puff" piece on al.com according to his daughter in law. The text was firm and stated that if he didn't stop lying to the media about the affair, the family was going to start telling the truth... The governor called me to his office on a holiday and wanted me to drive to Jackson, Mississippi to speak with his son and daughter in law about the letter. He basically wanted me to imply that they would be arrested if they released any information. The letter was firm, but there was no threat to him physically, a demand for money [and it did not] rise to the level of harassment". Collier said he explained that to the Governor and advised that threatening to arrest his daughter in law would be a bad idea. After a few days, Collier said Bentley accepted Collier's recommendation but added, "if they did it again...then he wanted them arrested". Bentley later fired Collier. The Bentleys are now divorced. Collier, who is now the Police Chief of Selma, Alabama isn't happy with Alabama's current governor either. He said taxpayers have paid more than $100,000 defending Bentley after Collier sued him personally and that, "Governor Ivey has personally signed off on the legal bills". He concluded by writing, "I am going to make sure the citizens of this state know that Kay Ivey is taking their hard earned tax money and using it to pay one of the wealthiest law firms in the southeastern U.S. to defend Robert Bentley in a personal lawsuit. If the only way to make sure the people of this state know the truth is to run against her, I will do it". 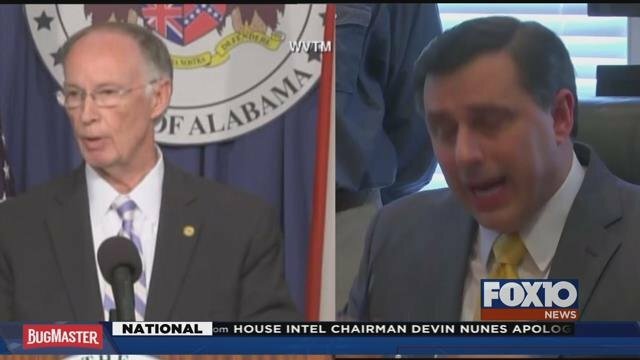 In response, Governor Ivey's spokesman, Daniel Sparkman told FOX10 News, "According to state law, all state employees and officials are entitled to legal representation paid for by the state's self-insurance fund (the General Liability Trust Fund, or “GLTF”) whenever they are sued in their individual capacity for damages arising out of their acts or omissions committed while in the performance of their official duties in the line and scope of their employment. The coverage committee for the Risk Management Division determined that at least one of the claims alleged by Mr. Collier concerns official action on the part of Gov. Bentley. Therefore, the statutory right of GLTF coverage kicks in. Coverage from the fund continues even after the employee/official is separated from service as long as it relates to conduct that occurred during state service." "As with any GLTF case, the former employee’s agency is required to be the contracting agency for the outside counsel appointed to represent the employee, even though fees are paid from the GLTF. Therefore, Governor Ivey, as agency head for the Office of the Governor, is required to sign off on the appointed counsel’s invoices before forwarding to the GLTF for review and payment. It is also important to note that the appointed counsel represents the former employee, not the agency or the State. The State of Alabama is not a defendant in the Collier case," said Sparkman.